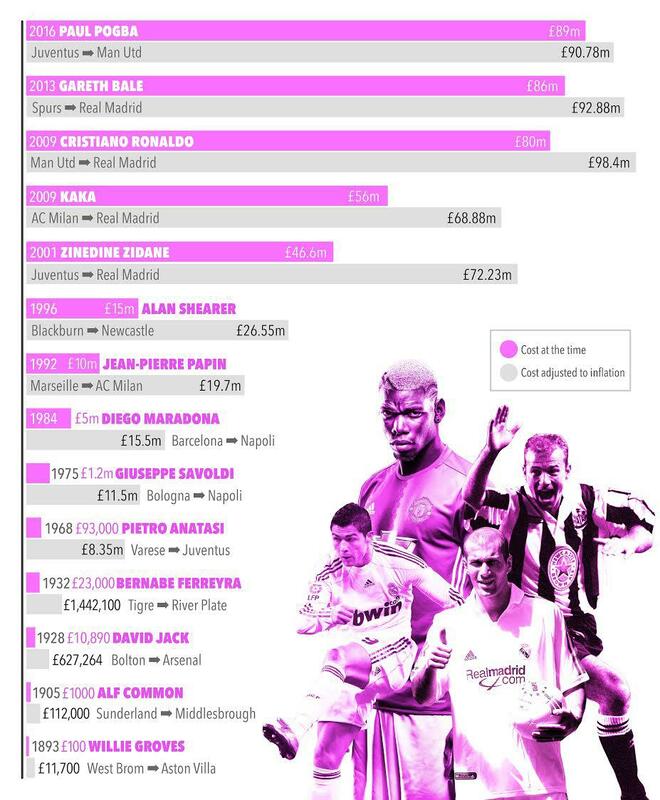 What is the most expensive transfer of all time if you used today's inflation rates? What is the most expensive transfer of all time if you used today’s inflation rates? The summer transfer window could see the world record fee smashed again - but what is the highest transfer figure if you used today's money? With the summer transfer rumour mill in full flow, talks of the world record fee being smashed are growing once again. Whether it is Cristiano Ronaldo or French starlet Kylian Mbappe, we are likely to see the highest fee paid for a footballer broken sooner rather than later. Which got us thinking – if you used today’s money, what would actually be the highest figure paid for a player in football history? Alongside this, should we re-adjust our thinking when it comes to the dates we earmark as the ‘big ones’? Because as we discovered, the first million pound player wasn’t Trevor Francis’ move to Nottingham Forest (the figure of which is still disputed anyway) in 1979, but if you used today’s inflation rates, was actually Argentinian Bernabe Ferreyra in 1932, 47 years earlier. So, to begin with, we looked at the world record transfer fees from 1893 to the present day, taking into account the ones we consider to have broken one of the major milestones. To see the graphic in higher resolution, click here. The first £100 transfer was Willie Groves, who moved from West Brom to Aston Villa in 1893. But, if you took today’s inflation rates into account, that figure would increase to £11,700. We used a historic inflation rate calculator to compare the cost at the time to the ‘true cost’ of today. Moving on, transfers such as the 1905 move of Alf Common from Sunderland to Middlesbrough was the first £1,000 transfer, which would calculate to being £112,000 in today’s rates. But things get very interesting when you look at transfers such as the 1932 move by Bernabe Ferreyra from Tigre to River Plate. At the time, he cost River Plate £23,000. But as you can see on the graph, he became the first million pound player if you take into account historic inflation rates. Not just that, but he absolutely smashed the record to pieces. Before that date every record transfer had been between British clubs, before the Argentinian giants splashed the cash on Ferreyra. The figure was so huge that he held the world record transfer fee for 17 years – the longest stretch of any player in history. In fact, with figures adjusted to inflation, his figure wasn’t broken until 1954, when Juan Schiaffino moved from Penarol to AC Milan. Moving onto the big numbers, the first £10million player according to adjusted inflation figures is Giuseppe Savoldi in 1975, when he moved from Bologna to Napoli. Of course, the truly huge figures came when Zinedine Zidane moved from Juventus to Real Madrid in 2001. Zidane’s transfer completely blew every other transfer fee out of the water at the time, with his £46.6million move a £9million increase on Luis Figo’s move to the Galacticos a year previously. The Frenchman’s transfer fee was so big that when you take into account the adjusted figures, his transfer fee was still bigger than that of Kaka’s eight years later when he moved from Milan to Madrid. However, as we well know, Madrid’s business in 2009 was far from done. Cristiano Ronaldo may be the subject to a record transfer fee again this summer, but the figure of £80million can still claim the top spot for the world record. The adjusted fee increases the figure to a whopping £98.4million, which still dwarfs Gareth Bale’s £86million and Paul Pogba’s £89million fees, as shown on the graph. Who would have thought it, Cristiano Ronaldo still bossing the world eight years after his world record transfer?